The trials, tribulations, and observations of my daily commute. To be read while listening to Bob Marley’s One Love. It’s no secret among my friends and family that I’m a wee bit self-centred, especially considering my favourite saying is “it’s all about me”. Case in point, my mom recently called me saying that she and the family were looking for a list of what I want for Christmas…she eventually stopped me due to writer’s cramp – true story! As much as I like to receive, I honestly do like to give, so imagine my surprise and delight when I heard them announce on the radio as I was leaving for work that it was “Giving Tuesday” – what a fantastic idea! I was already bringing lunch to share with a friend at work, Mercedes da Playa, (her gangsta name) so I figured I was set for the day. During my commute in, I was mentally patting myself on be back for being unwittingly prepared for this auspicious day, when I saw a businessman man at the train station walk up to the ticket kiosk and leave his ticket for another traveler. 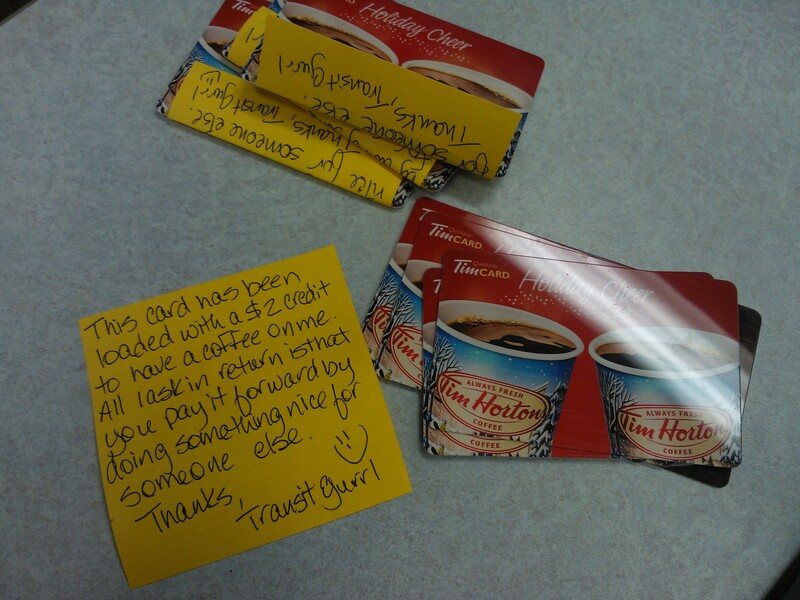 Okay, I know this is frowned upon by Translink, but I thought it was a nice gesture. The giving didn’t stop there – Mercedes shared her breakfast with me, and my friend and his husband gave a passenger bus fare during the commute home. I felt a bit like the Grinch after he had spent all of that time down in Whoville because I began to want to do more so that night I hatched a plan. Ah, a flaw in my plan! Back at the office, we discussed what happened with our colleagues, who said the driver probably thought we were doing some sort of promotion for Timmies. Good point…on to plan “B”. It’s safe to say that I’ve been getting lovely responses from the people who do accept the cards, but what’s especially great are the changes I’ve seen in me and my life. Aside from the giving, I’ve decided to adopt the attitude of going with the flow, so when things don’t quite go as planned, I am looking for new opportunities that I wouldn’t have otherwise encountered. It’s pretty amazeballs so I suggest you all give it a shot. Remember when I said that it’s all about me? I really wasn’t kidding and it still is. Here’s the thing, handing out the gift cards feels so good that it’s kind of addictive. It’s so addictive that instead of going to a sample sale of my most favourite purse designer in the world, fiveleft leather, I instead opted to buy more gift cards to hand out. I’ve also learned that I have to ration how many cards I keep on my person otherwise I’ll give them all away at once. So here’s the thing…I’ve been keeping track of everyone I’ve given a card to thus far and this list will be posted on my Transit Gurrl page on Facebook. I encourage all of you all over the world to do something for others and post it on my Facebook page because there could be a little something in it for you, and I mean more than that great feeling that comes from doing something good. This is the official launch of the Transit Gurrl Pour it Forward Contest! This contest is all of my readers around the world. To enter, simply post your good deed(s) on my Facebook page. All entries must be received by January 31, 2014. Further details about the contest will be posted on Facebook but in the meantime, get out there and do some good! This entry was tagged Bob Marley, bus, Business, Canada, Canada Line, Christmas and holiday season, coffee, commute, commuter, Facebook, Gift card, giving, pay it forward, random acts, Skytrain, Tim Hortons, Timmies, transit, translink, Travel and Tourism, Vancouver. Bookmark the permalink. Pingback: Transit Gurrl | Did Somebody Say Prizes?